One of the latest trends in the search engine market seem to be custom search options, search filters and specialized search parameters. 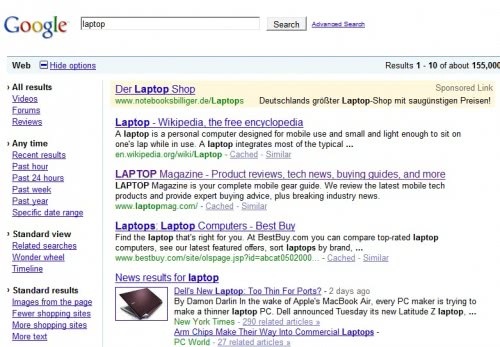 Google has introduced the search options in the main Google search engine a while ago. These were made up of advanced search parameters which have been accessible before (before starting search) and new filters. A click on the Show Options link on a search results page will open the available options in a sidebar. Past hour and Specific date range: With these tools you can choose to see only the most recent results in our index, or see results from a specific time period. This can be particularly helpful when you're looking for the freshest information, or if you have some idea of when the information you're looking for may have been published to the web. More shopping sites and Fewer shopping sites: Now you can choose "More shopping sites" to show additional commercial pages and display prices from those pages right in the search results. If you're doing product research and are not quite ready to make a purchase, you can choose to see "Fewer shopping sites" to filter out many of the commercial sites. Visited pages and Not yet visited: Rediscover pages you've visited before by clicking "Visited pages," or filter out the websites you've seen by clicking "Not yet visited." This can be particularly helpful when you're researching something you've already explored and you want to return right where you left off. To use this option you'll need to be signed in to your Google Account and have Web History enabled. Books, Blogs and News: Click on these filters to see results only from these sources. Putting these filters together, along with videos, forums, and reviews, allows you to quickly switch between different source types right on the search results page. The past hour and specific date range parameter was accessible through url parameters before only. The inclusion in the search options makes it easier to use this parameter. Search engine users can now increase or decrease the amount of shopping sites that are displayed in the Google search results which can be very handy depending on the type of search performed. Visited pages and not yet visited is only available for users who are logged into their Google account and have web history enabled. This can be interesting to continue a search at a later time without having to revisit pages that have been visited before. Books, blogs and news finally allows to refine search to only see results from these sources. They are similar to the previous source filters which allowed search engine users to only display results from sources that were videos, forums or reviews. It would be interesting if Google would reveal statistics about these custom search options to see how many search engine users make use of them. Which leads to this question: Have you used the custom search options?